Please refer to our stock # TBD00249 when inquiring. 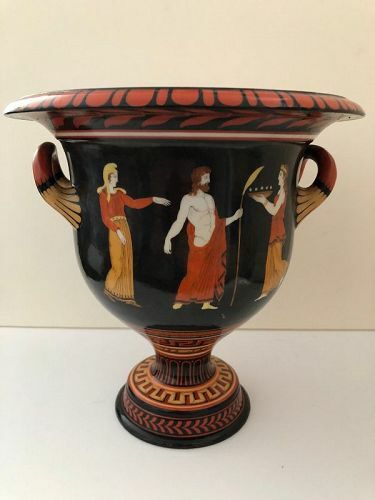 A very well decorated two handled urn or vase with everted rim with a black background showing figures in classical garb around the main portion of the body and with elaborate continuous ornamentation, mostly in orange on the outer edges and handles. No makers mark or mark for the country of origin, but likely to be English (possibly by Samuel Alcock & Company). It might be French. In either case based on the style it was made around 1850. 8 5/8 inches (22 cm) tall and the same diameter. Condition: No chips,, cracks, hairlines or repairs. In a couple of places the black ground looks a little thin, but this may have been in the initial decorating. A very striking and finely decorated urn.